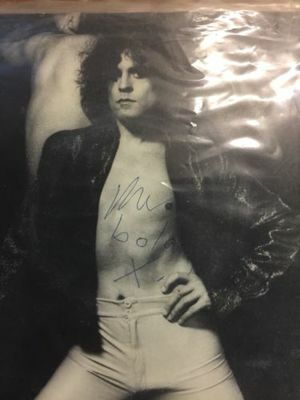 With heavy heart I’m selling this Marc Bolan signed single, Celebrate Summer. This was the last ever T.Rex single released in Marc’s lifetime. It was signed in Manchester at the Film Exchange on Quay Street. It was in August 1977, I cannot remember the exact date but it was not long after Elvis died as Marc talked about that. It’s in excellent condition and Marc’s signature is clearly visible. It’s hard to let it go but I’m selling purely because I’m thinning out my collection and I still have plenty of other Marc memorabilia. It’s time for someone else to look after this item, happy bidding!